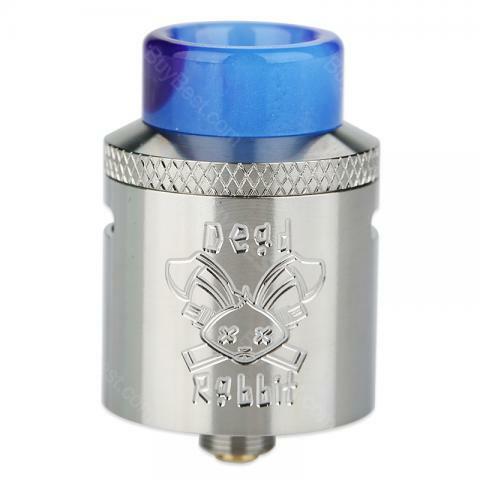 Hellvape Dead Rabbit RDA, a Heathen's rebuildable project, features adjustable top side diagonal airflow, top terminal four post build deck, available for single and dual coil buildings. The Dead Rabbit RDA, designed by Heathen has a unique top terminal four post build deck, which offers ample building space and takes the guesswork out of pre-cutting coil leads. Top side diagonal adjustable airflow focuses on flavor and minimizes leaking. A gold-plated positive post, knurled grip and bottom feeding pin all contribute to an advanced vaping experience. The 24mm Dead Rabbit is a good choice for builders and squonkers alike. 2. It doesn't include 18650 batteries. Excelente ato, de mis preferidos, anteriormente lo tenia y lo regale, hoy lo recupero, muy recomendable. Absolutely the best quality ever! If you love dripping and do it everyday for your habbit or fornfun then get this hell v ape dead rabbit. Best one ive had and it has. Excellent flavor and clouds like crazy! Buy best makes sure you get the best and doesnt brip you off like other will. Its a long shipping process but well worth the wait. I wonder who came up with this name Dead Rabbit haha. Hellvape Dead Rabbit good for both single coil and dual coil building, nice airflow by the way.